Located just two hours from Quito, mid-way between Pappallacta Hot Springs and San Rafael Falls. 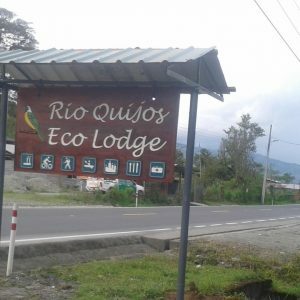 RíoQuijos EcoLodge is located in the Quijos Valley, in the Napo region, on Route45 between the towns of San Francisco de Borja and El Chaco. International Arrivals: We recommend you fly into the Quito International Airport. 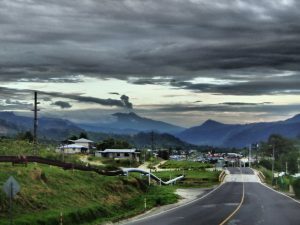 We can arrange private transportation for you from the airport to the lodge. Travel time to the lodge from the airport is approximately 2 hours. From Quito: Mileage is 114K. Take Route28, over the Pappallacta Pass to the partideo at Baeza; veer onto Route 45. Drive 8k to Borja and an additional 4k. The entrance gate is on the right directly off the highway. From El Chaco: Mileage is 6.2k. Head SW on Route45 on Route45. The entrance gate is on the left, directly off the highway. 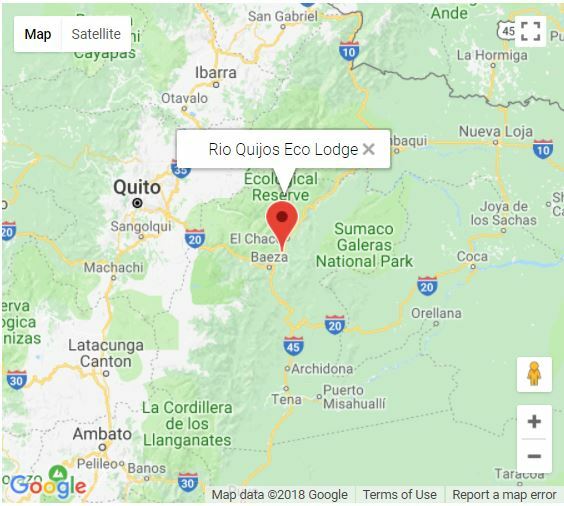 We can arrange private transportation from any location in Ecuador to our lodge.